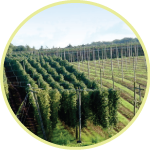 The hopyards of Herefordshire, Worcestershire and Shropshire produce more than half of the hops grown in the UK, but most beer drinkers are unaware that these farms even exist. 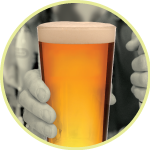 So, in 2013, many of the counties’ hop growers and brewers came together to shine a welcome light on the region’s hop-growing prowess and the vital role it has to play in the future of British brewing. As a first step, we felt we needed a new, succinct and memorable way to refer to Herefordshire, Worcestershire and Shropshire as hop-growing counties. We decided to call them England’s Hopshires. Next, during the hop harvest in September and October, local brewers will each produce at least one beer using only hops that are from the Hopshires. Over time, we hope to see the Hopshires name become synonymous with all that is good about great British hops and the beers that are brewed with them.